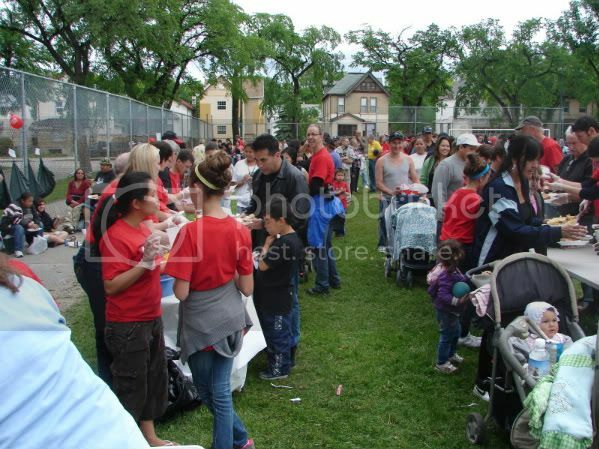 For the last 6 or 7 years Winnipeg churches have been partnering together in an amazing campaign called Love Winnipeg. We got the idea from Love Abbotsford which does a one day blitz of random acts of kindness in their city. We expanded on the concept and do two full weeks. 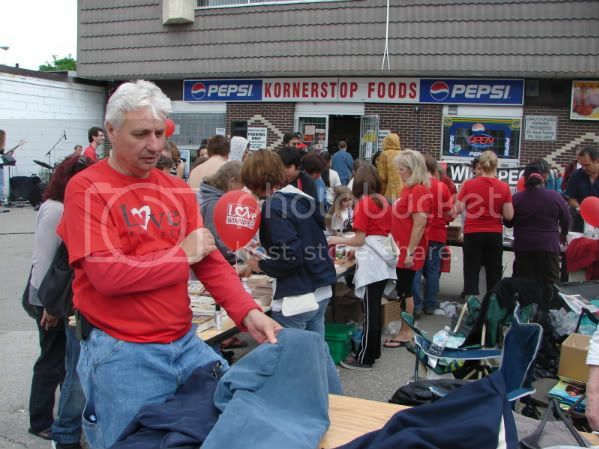 We don red Love Winnipeg shirts and hit the streets to pick up garbage, remove graffiti, feed to poor, clothe the homeless, plant flowers, mow grass, rake leaves, paint fences, visit nursing homes and on and on. The campaign kicks off with the Red See Rally. Thousands of red shirted christians gather at the Manitoba Legislative grounds and then we fan out to clean up the streets and spread the love of God. This year we got rained out on May 30th so we have rescheduled to Sunday June 13th at 3 PM as a wind-up instead. If you are in the city on Sunday, come join us! Our church has adopted an area of town called Osborne Village. The Village is one of Winnipeg’s most unique places with a mix of trendy shops, street kids, drug culture, homosexuals, etc. We found a dozen street kids living under the Osborne bridge. A group of our young people cleaned up their somewhat disheveled abode. We hauled 99 bags of garbage out of the Village in just over an hour. Here are some of us last year as we were gearing up to head into Osborne Village. June 6th we did what we call Caring for the Core. The 85 or so participating churches concentrate our efforts on the somewhat economcally depressed core area of the city. We do dozens of major carnivals in varous neigbourhoods. The people come out in droves and are gracious and grateful for the food, fun and fellowship. Church of the Rock’s chldren’s ministry did a project called Love on Wheels. A group of men fixed up a couple of dozen bikes and gave them away at one of the carnivals. They were all gone in just a couple of minutes. Every age group in our church gets involved (by kathleen). 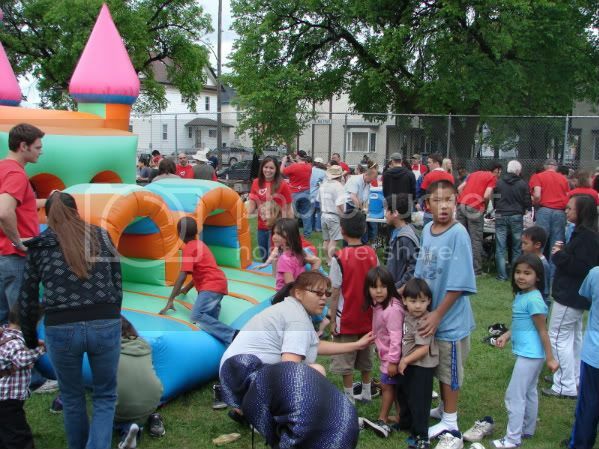 It is touching to see our suburban young adults interacting with the inner city kids. Everyone gets into the act. 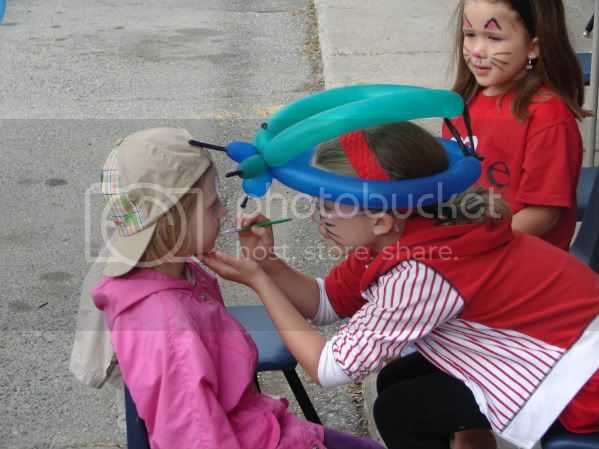 This little girl is maybe 10 years old and spent the whole day face painting other kids at a street party on Sherbrook. Over the course of the two weeks 1000’s of lives get touched with the love of God. It is easily the most effective thing the church in Winnipeg does over the course of the year. If you live in another city there may be a campaign going on there. If not, talk to your pastor about getting one started. Even if only a few churches get involved at the beginning, others will join. Our tag line is; The only thing missing is You! Here’s our promo video. Enjoy! No, better yet, get involved!